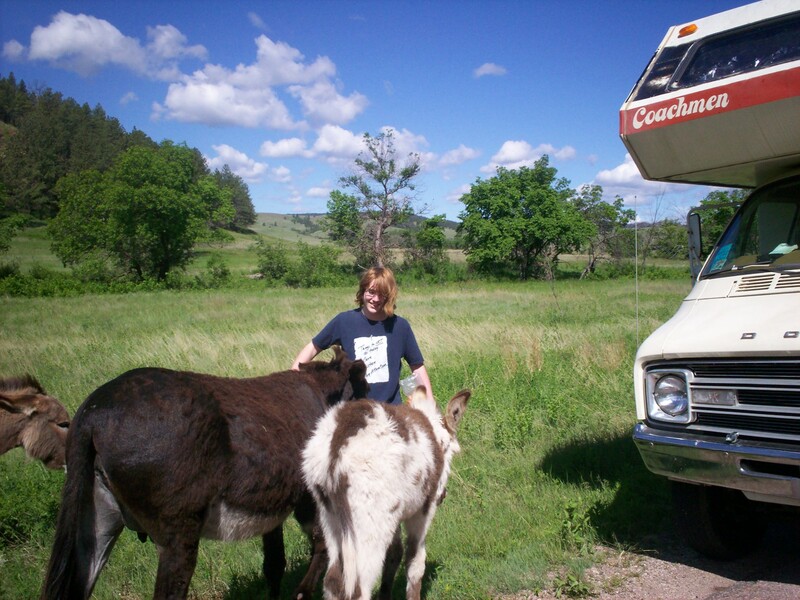 Our 2009 Road Trip, Part 12: Burros Barge in Where the Buffalo Roam « Midlife Crisis Crossover! South Dakota scenery can be lovely in itself before the animals begin to intrude. 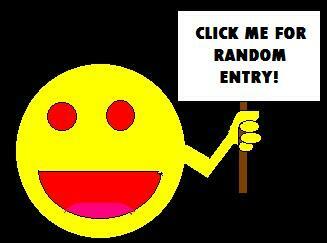 DAY FIVE: Tuesday, June 16th. Breakfast was at the hotel’s free buffet. 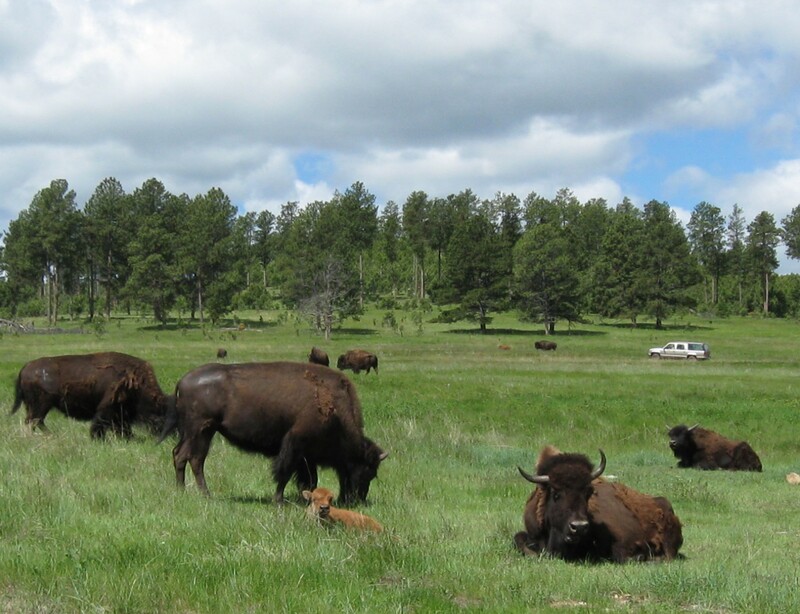 First stop of the day was Custer State Park, located in the town of Custer, out in the Black Hills. This was something Anne had particularly looked forward to because of my son’s legendary love of animals. 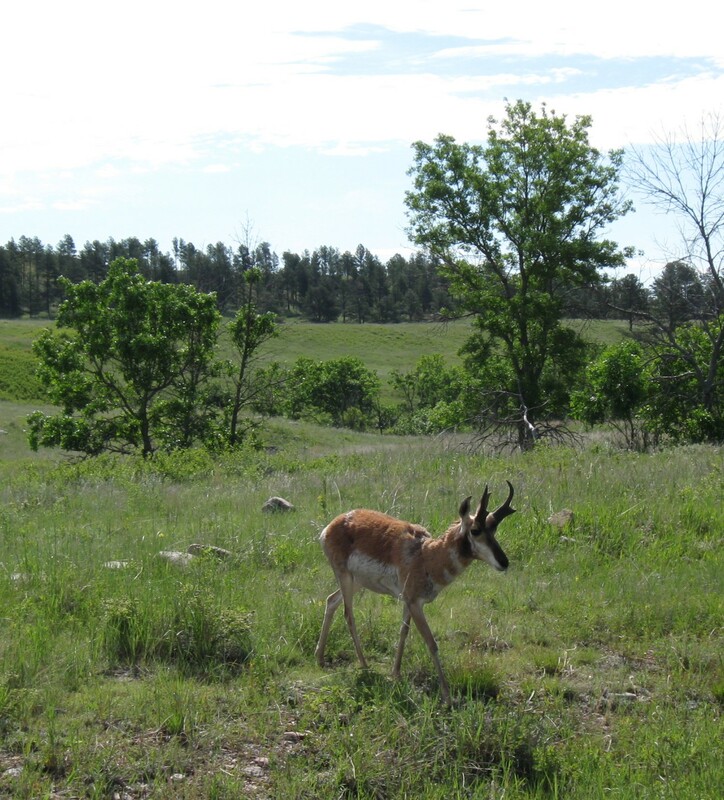 South Dakota’s first official state park rose to prominence in the 1920s during Calvin Coolidge’s administration and boasts a wildlife loop that is famous for having animals pop up out of nowhere or loiter in the open. We understand there are people who live in places where spontaneous sightings of live animals are a regular occurrence. We are not those people. We have active populations of opossums and raccoons that exist only as roadkill, never sighted alive in our suburb. For us, the opportunities to point our fingers toward our front lawn in the morning and yell, “Bunny Rabbit!” are as good as it gets. Unless you count those fetid, roving packs of Canadian geese, which we don’t because they’re awful. The first few miles of the loop were entirely flora sans fauna. Several miles of grassy desolation marked much of the route, but thankfully not all of it. Eventually live specimens began creeping into our path. 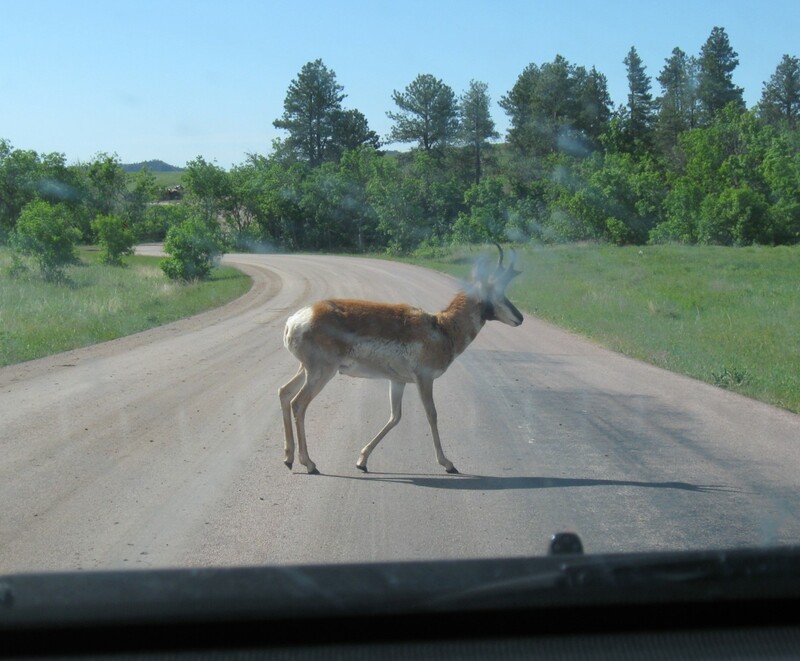 This lone pronghorn antelope was the closest thing we got to a welcome wagon. 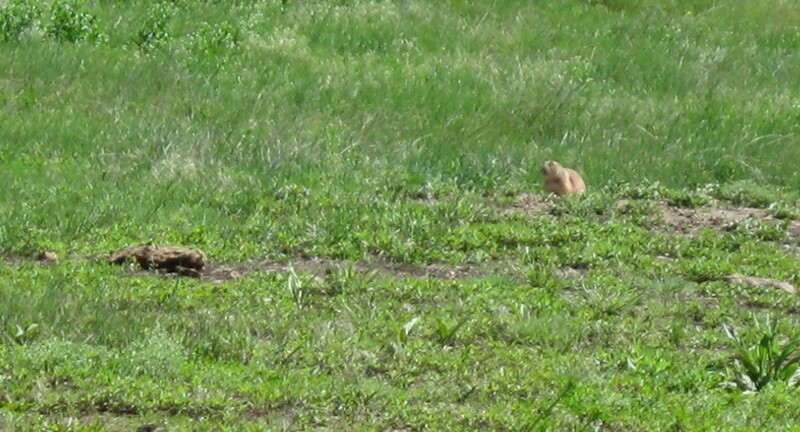 A small colony of prairie dogs kept their distance. More of their kind awaited us in our future. We wondered how many animals had been scared away by the loud, obtrusive military convoy that had at one point passed us by, likely encouraging them to vamoose. Miles and miles and miles later near the end of the official wildlife loop, we found Custer’s resident bison herd, frittering away their free time at their favorite loitering hole. 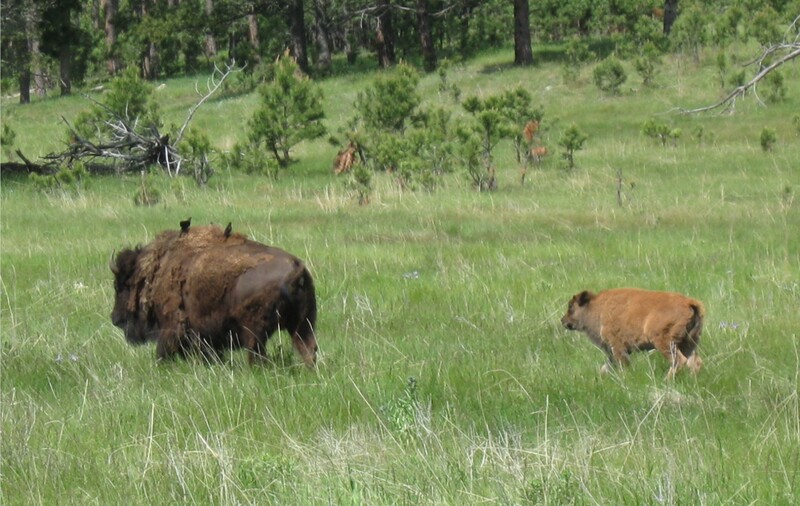 We understand bison are fairly territorial. 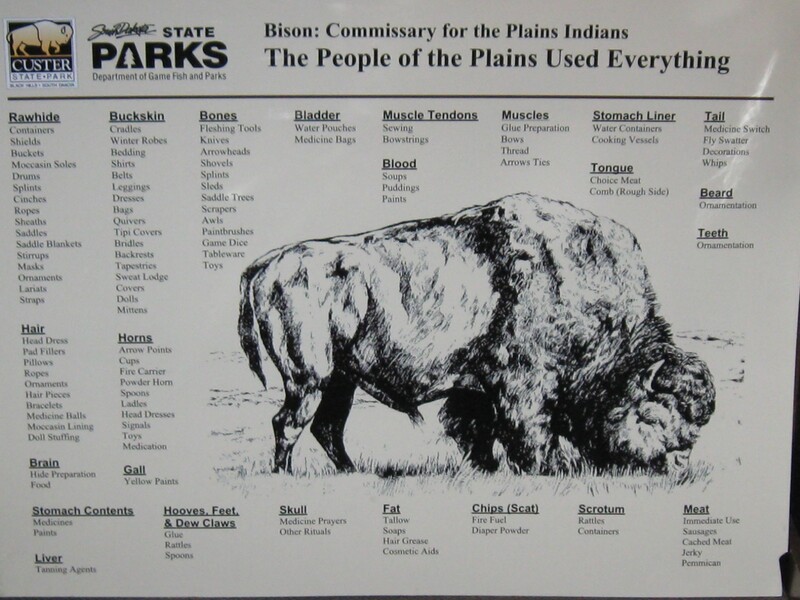 The park literature, the roadside signs, and the official motto of South Dakota warned us DO NOT APPROACH THE BISON. Rather than take our chances, we kept the windows closed and watched the herd migrate wherever, crossing the street with no concern as to the minimal threat our two-ton metal vehicle posed them. 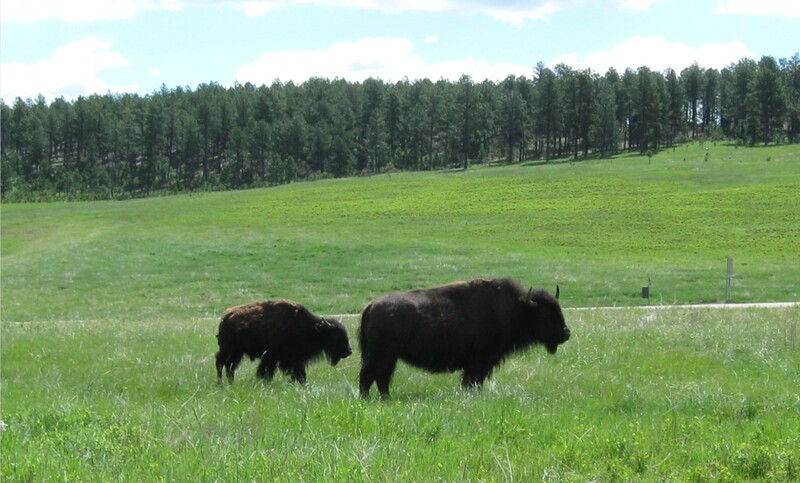 Disinterested bison, used to hanging out and not being wowed by the Black Hills scenery. Some bison eyed us skeptically but were unimpressed. Some bison retreated and had better things to do. 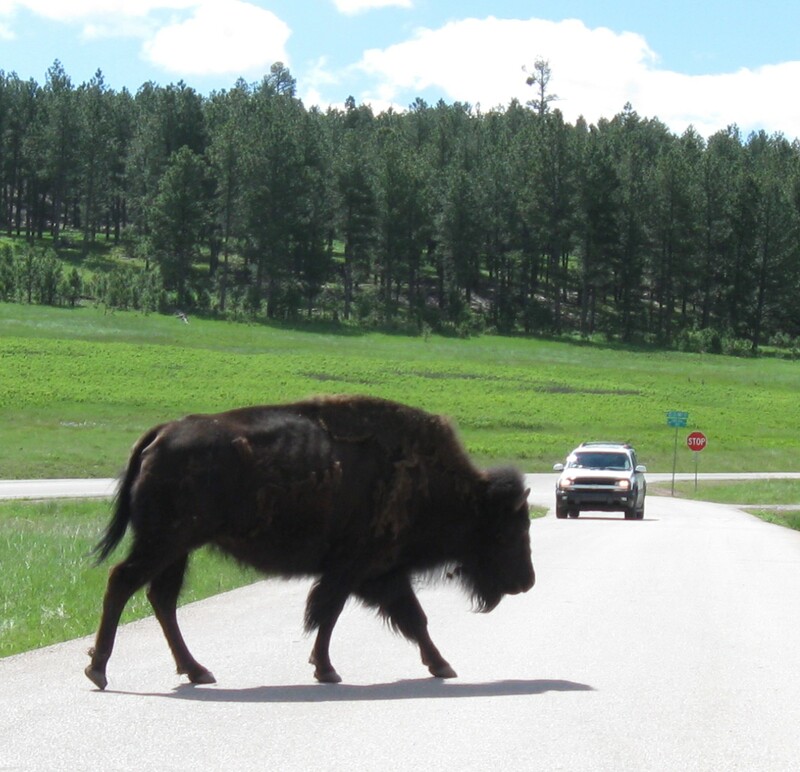 This bison usurped the right-of-way and dared puny humans to start something. 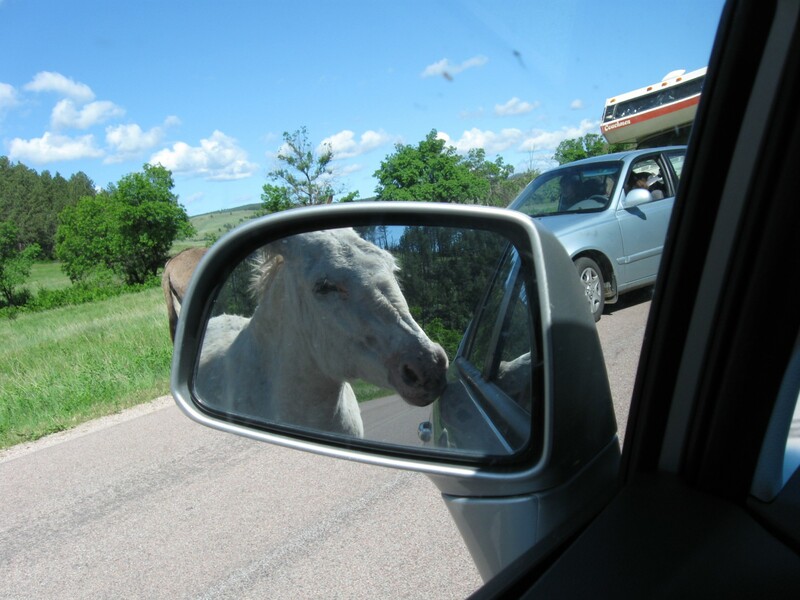 We perused the Custer State Park Visitor Center before leaving the grounds and returning to the non-Custer portion of the highway. I don’t recall buying anything, though I was momentarily tempted to buy a copy of the bestselling how-to guide Who Pooped in the Black Hills? In lieu of physical souvenirs, I instead copped some practical advice for future reference. Had we played chicken with the bison, these could have been our prizes. What infant wouldn’t love a bison scrotum rattle? The middle length of the wildlife loop was our feature presentation. After too many miles of plains upon plains, one fateful rounding of a corner brought us to…the attack of the Begging Burros! The Begging Burros, as they’re nicknamed by the park runners themselves, descended generations from their ancestors who were brought to the park decades ago for its initial pre-population. The burros roam the park freely and of their own will. 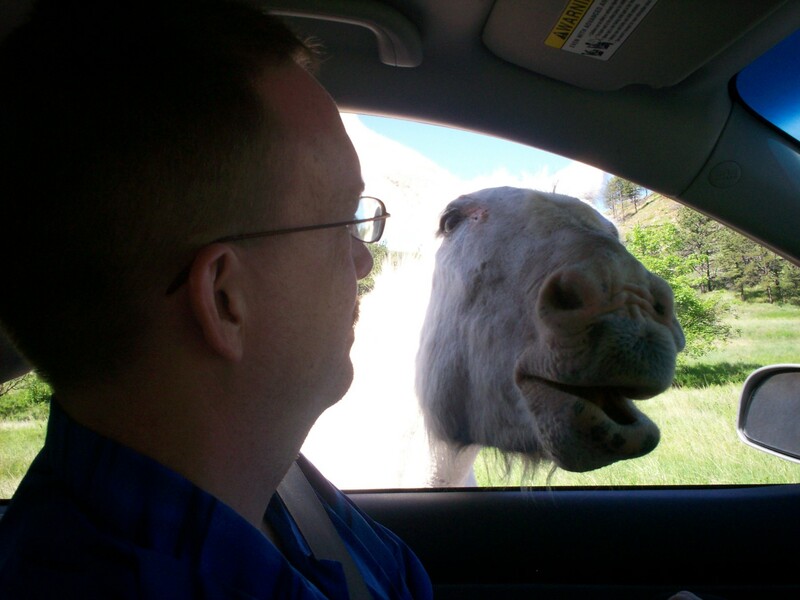 They developed the survival technique of looking cute enough to con drivers into stopping to stare, thus allowing the predatory burro to hound the sucker and their passengers for free food until the windows can be safely rolled up and escape becomes feasible. Several cars had already fallen for this insidious ploy and we were determined to be among them. Never mind that the park literature advised all visitors not to feed the burro. 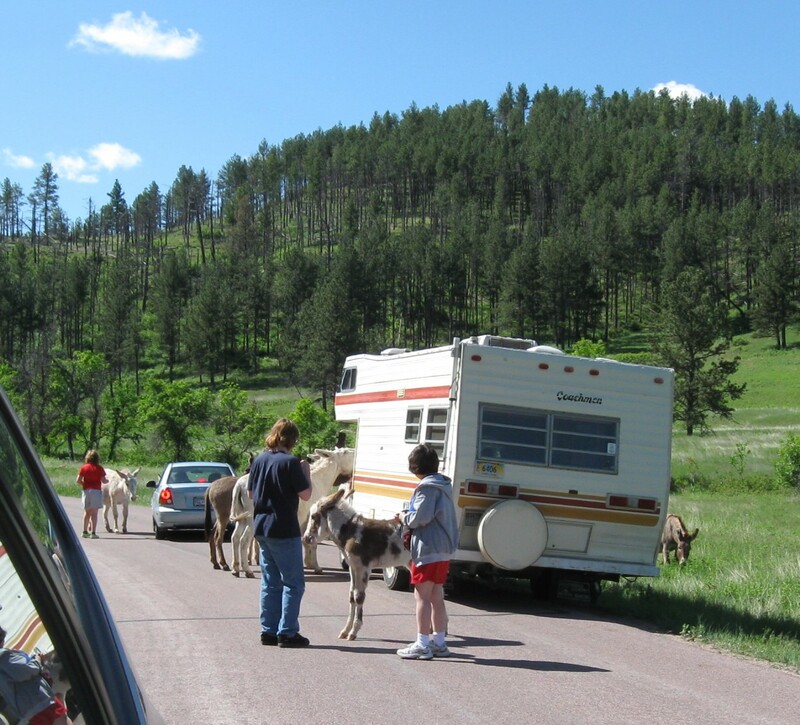 Behold the Begging Burro traffic menace. Fortunately this wasn’t rush hour in the big city. 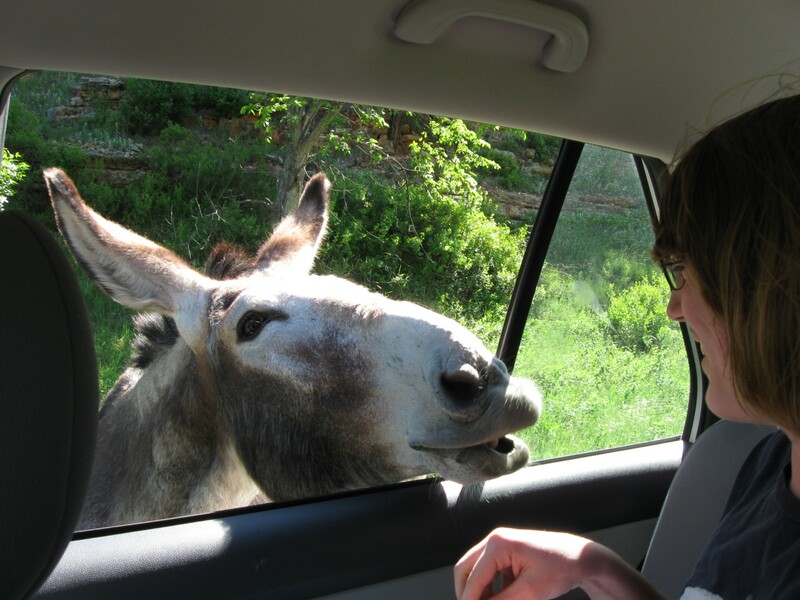 My son was surprised and delighted to have a burro stick its head into his window to get at the Cheez-Its he brought along as bait. Even those of us without bait were subject to surprise inspections. At least most hobos keep their heads out of your windows. This burro offered only codependency and criticisms of my driving. They refused to withdraw until we threw handfuls of Cheez-Its over their heads and in the opposite direction. The distraction was simple but effective and allowed us to shut our windows as quickly as possible without turning one of the poor beasts into a prop from The Godfather. My son craved more attention from his new subjects. He got outside of the vehicle and became a sort of Pied Piper with his coveted box of Cheez-Its. He found his newfound power over the burros rather intoxicating. I suspect this is the moment when the burros began conspiring to overthrow him and take the Cheez-Its as their war prize. Anne got out and helped supervise, chasing away his new friends with her step-parenting uncoolness. I stayed in the SUV to forestall any possible burrojacking. 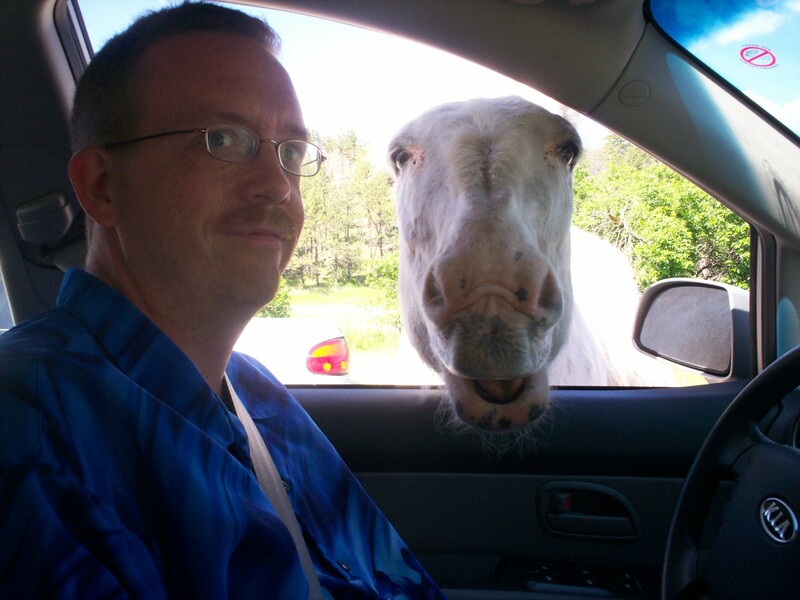 Remembering how he nearly lost a finger to savage baby deer in a quarter-feed incident at Marineland in 2004, we summoned him back in the car so that the tourists parked on the other side could have their turn at satisfying the burros’ hunger pangs. 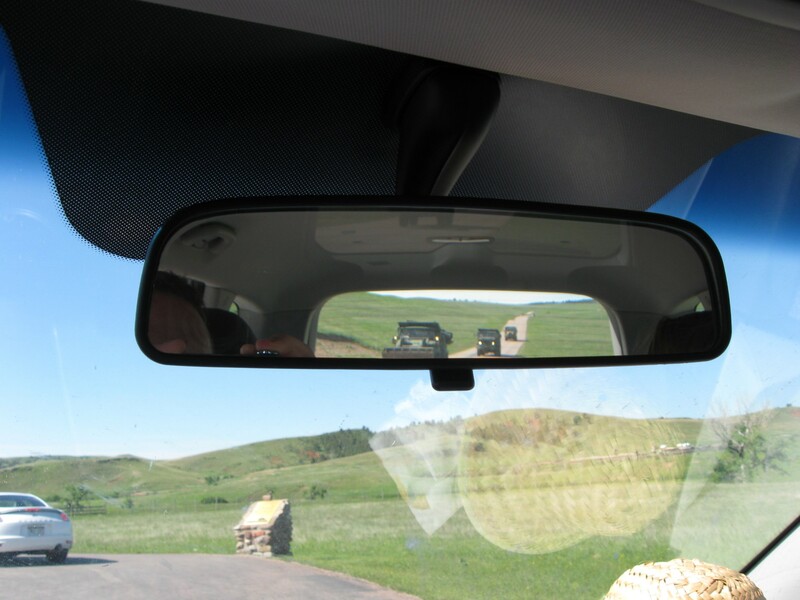 CAUTION: BURROS IN MIRROR MAY BE HUNGRIER THAN THEY APPEAR. We were there when my daughter was five, sitting in the back seat eating an apple. A burro stuck his head in and swiped it. Fortunately, she giggled and laughed and was not forever traumatized by donkeys! Ha! It’s a good thing she didn’t mind sharing! We were a little nervous and taken off-guard at their audacity at first, until we could tell they were more of a nuisance than a threat. I’m not sure how we would’ve handled it if we hadn’t had those Cheez-Its with us to use as distractions.